The vibrant tones of yellow are the key toany places in the sun. 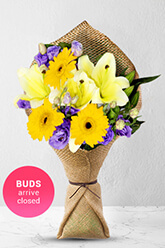 This bouquet has justthose ingredients with warm streaked of whiteOriental Lilies, yellow Gerberas and strikingpurple Eustomas. Send this bouquet tosomeone who in need of a vacation.Lilies may be sent closed/partially closed inorder to prevent damage and to last longer.Vase is not included however; for a lastingimpression we recommend a Superior Vasewhich is the ideal selection for this gift. Service excellent. Easy to order. Delivered on time. And looking good. Both recipients said the flowers arrived early in the day/at a convenient time and they were beautifully presented. Easy site to use and prompt, and lovely arrangement.